Most people agree that honeybees are quite useful. Africanized honeybees, however, are an entirely different subject. One of the main problems is that people don’t realize the difference between Africanized honeybees and the European honeybees that we are familiar with. This is because they look extremely similar and only those who work or study types of bees will recognize the differences. The main way that the two are different is in their behaviors. While any species of bee will be defensive of its nest, Africanized honeybees are extremely protective of their nest and their boundaries are much larger as well. What they consider their “home turf” can be at least 100 feet from their hive, which is what makes it so dangerous for Africanized honey bees to live around people. They are also willing to settle for a smaller place to call home – even something as small as a soda can will do! See a Hive? Stay Away. The second you notice a lot of bees buzzing around get away from them. This could mean that there is a swarm traveling to seek out a new place to build a colony or that there is already a colony somewhere in the vicinity. Africanized honeybees will readily attack anyone they consider a threat to their home. Never try to destroy a nest by yourself! Improper techniques or products used will only irritate the bees further and make them more defensive. If you are allergic to bees, never ever try to take care of the problem yourself. It is far too dangerous. Bees are persistent and will follow you even when you run away. Jumping into water will also not work because the bees will simply wait for you to come up for air. 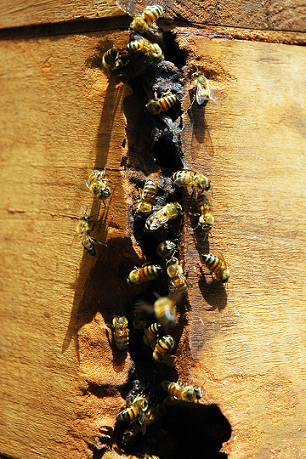 If you have Africanized honeybees making a nest at or near your home – or even if you aren’t sure what type of bees they are – it is always in your best interests to call in professionals to handle the situation. Bees can be dangerous to people in large numbers, especially those allergic to them, small children, and pets. If you see a swarm, never approach it, and again, call a professional pest control company. They can come out with the right tools and products that will allow them to take care of the bees and make it safe for you and your family once again. They can also do a thorough evaluation of your home to make sure there are no other nests nearby, as well as inform you about what you can do to help prevent bees from being attracted to areas near your home.